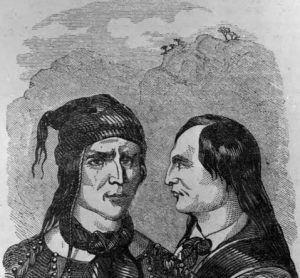 Drawing of Wakara and his Brother from an 1855 book. While he was a young man, the Spanish did everything they could to keep the Indians in check by promoting raids and violence between the tribes. With language skills that included Spanish, English and several native tongues, he became a skilled negotiator. Also known for his excellent marksmanship, discipline, and bravery, he quickly became a leader, gathering a raiding band of warriors from the Great Basin tribes, including Utes, Paiute and Shoshone. Attacking ranches and travelers along the Old Spanish Trail between New Mexico and California, other tribes feared his reputation to such an extent that they paid him tribute in return for protection and assistance. Often wearing yellow face paint, he became known as a great horse thief, stealing some 3,000 horses in southern California in the 1840s. Mountain men, James Beckwourth, and Thomas “Pegleg” Smith were known to trade with Walkara, providing the band with whiskey in return for horses. In 1845 Justice of the Peace and assistant for Indian Affairs in Riverside County, California, Benjamin Davis Wilson, ordered that Walkara and his marauders be tracked down and brought to justice, but he had no success. By the time that the Mormons began to settle central Utah, Walkara had become the chief of his Ute band who were, at first, helpful and cooperative with the Mormons. However, when the Mormons began to attempt to suppress New Mexican trade, tensions developed with the Ute, who had long depended on the trade, especially that of native slaves, to which the Mormons strongly objected. Though Brigham Young had negotiated a trading relationship with Chief Walkara in 1850, the colonists began to interfere in many of the Ute transactions. At the same time, the area was being traveled more and more with non-Mormon trading expeditions and settlers and in a few isolated instances, some Ute Indians were killed. These tensions soon led to the Walker War, where Walkara led a number of Ute raids against the Mormon outposts. The Walker War ended through negotiations between Young and Walkara during the winter of 1853. Casualties during the war equaled about twelve white settlers and an estimated equal amount of Indians. Some of those coming in the most cited incident, the Fountain Green Massacre, when on October 1, 1853, members of the Ute tribe killed four men encamped at Uinta Springs. Eight Utes were murdered in Nephi Utah in revenge of the massacre. The next summer after the conflict ended, about 120 of Walkara’s tribe were baptized as Mormons. Although immediate hostilities ended between the Mormons and the Ute, the underlying conflicts were not resolved and isolated incidents of violence continued until Walkara’s death in 1855 at Meadow Creek, Utah. © Kathy Weiser/Legends of America, updated April 2019.